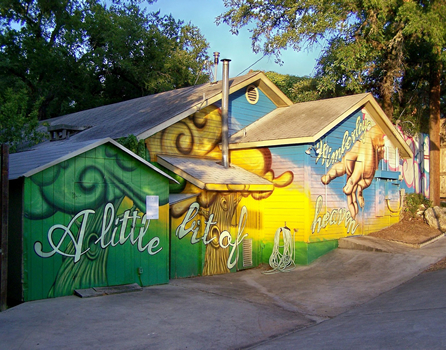 In addition to the Square, Wimberley offers unique entertainment that draws from the area's concentration of artists and from its natural beauty. Wimberley's famed Market Days offers shopping and antiquing adventures for everyone with hundreds of artists, craftspeople and merchants the 1st Saturday of every month from April-December. The Corral Theater is Wimberley's outdoor movie theater - bring your own lawn chair! It is open Friday - Sunday nights Memorial Day thru Labor Day. EmilyAnn Theatre is an outdoor amphitheater with a spectacular view of Wimberley Valley. It features garden areas and wooded paths leading to small performance clearings as well as a main stage. Wimberley is known for its live music. There are several venues that feature great local, Austin-based and nationally known musicians. These include the Wimberley Café, Linda's Fine Foods and Ino'z on the square. If you’re lucky you may catch a performance by Willie Nelson, Ray Wylie Hubbard or other well-known composers and performers. Also abundant are adventures for active souls. With rolling hills, sweeping vistas and unspoiled beauty, the area is perfect for hiking, biking, running and walking. Golf is also popular with locals and visitors. With the Blanco River and Cypress Creek in town and the Guadalupe River and Canyon Lake nearby, water sports abound. These include canoeing, fishing, tubing, rafting and boating. 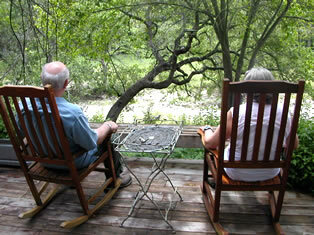 Walk to breakfast, lunch, or dinner in one of Wimberley’s great restaurants on the square or on River Road. Other dining adventures await you just outside of Wimberley as well. We provide dining information for you at Sundance and Moondance and on our “best of” list. Wimberley is the heart of Texas Hill Country fun, located just 20 minutes from San Marcos, 45 minutes from Austin, 1 hour from San Antonio, 30 minutes from New Braunfels and close to dozens of well-known Hill Country towns such as Fredericksburg, Gruene and Lukenbach. You'll find vineyards, orchards and farmstands in almost all directions. Drive the nearby Devil's Backbone for some of the best scenery the Texas Hill Country has to offer.